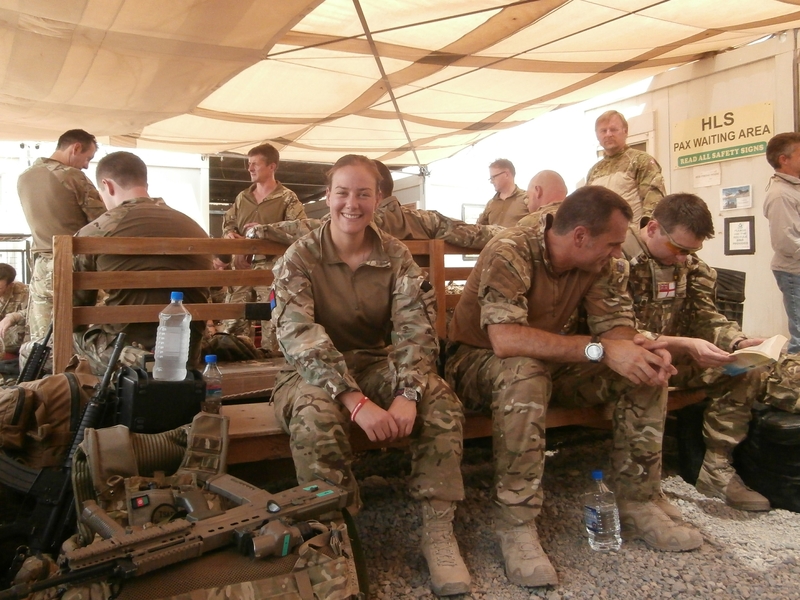 Captain Sophie Whitaker is a serving war artist whose main job is to provide Joint Fires Targeting support to Task Force Helmand on OP HERRICK 18. 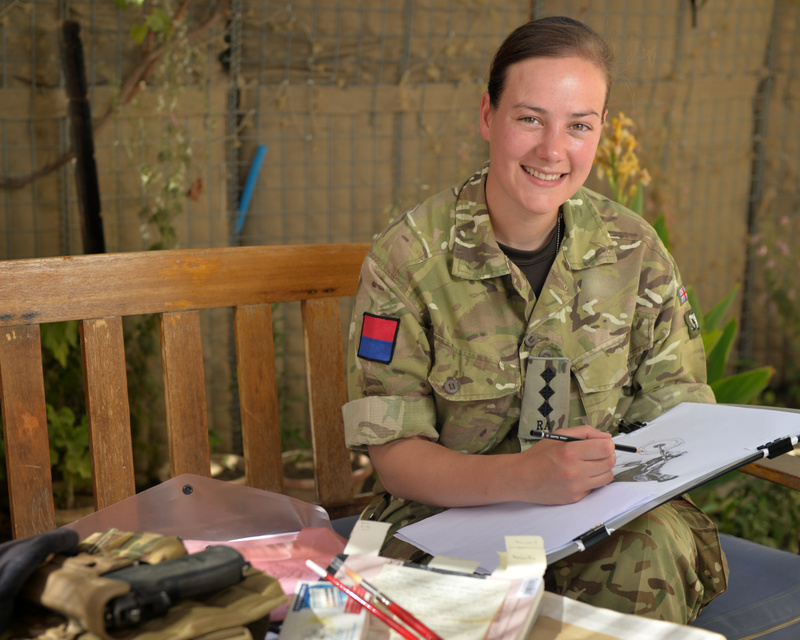 As a member of 74 Battery (The Battleaxe Company) 39 Regiment Royal Artillery – attached to 1 Royal Horse Artillery, Sophie works in the Brigade Headquarters, Lashkar Gah, where she finds time between an often hectic schedule to put pencil to paper. How quickly time is still flying by, I have now been back at work for just over two weeks and my handover will be here in another two. 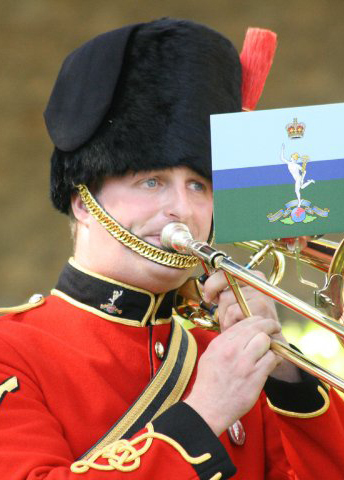 Now fully re-charged and re-energised I will endeavour not to succumb to what is most commonly known as the R&R blues – a condition that affects 99.9 per cent of personnel returning from the joys of a restful R&R to the high tempo and routine of OP HERRICK. Determined not to allow this to creep in, I hit the ground running and I felt as if I had never left. It was actually a pleasure to see the familiar faces that I have been working alongside for the past five months and listening to their experiences on R&R with reinvigorated spirits and renewed enthusiasm… although this rapidly faded into the general routine hubbub of the working headquarters. Time certainly wasn’t going to drag during my first week back as my Battery Commander (BC) was due on his R&R and therefore I would have to cover some of his tasks and staff work. 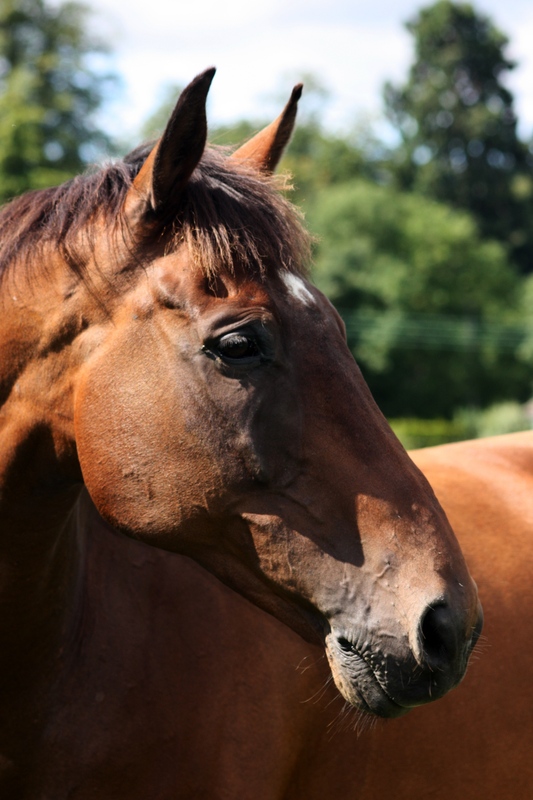 With a comprehensive set of handover notes – all rigidly hyperlinked and absolutely foolproof. My BC has now returned and I managed to accomplish the tasks I was set and await the next drafting for various pieces of staff work to include; the Relief in Place (RiP) , handover and normalisation FRAGOs (Fragmentation Orders) , a Post Operational Report, and a Mission Exploitation presentation. All of these are essential to ensure that our handover to the next brigade is professional and informative to provide a seamless transition from one to the other. The Post Operational Report and Mission Exploitation are key documents to enable all the lessons learnt from our tour to be collated and discussed to improve our capability and deployment for the future. 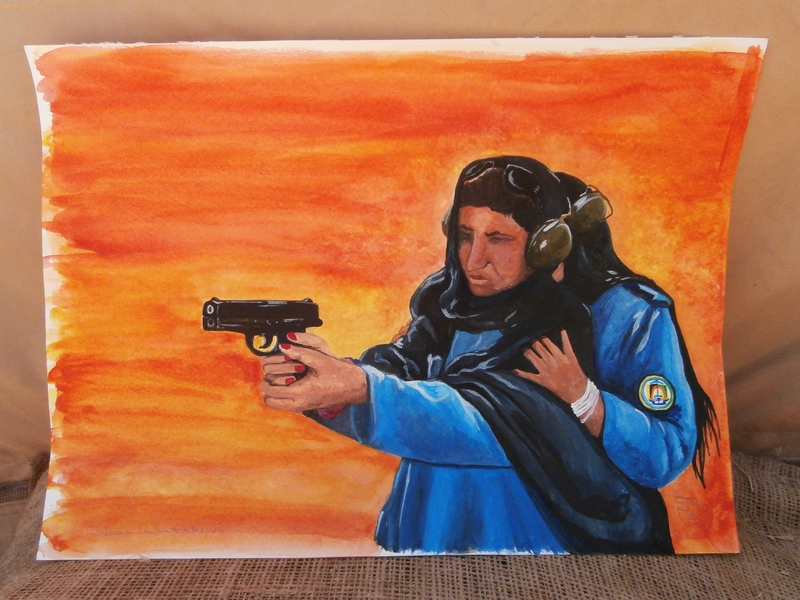 This blog’s painting is referenced from a photograph of two Afghan Uniformed Police (AUP) women on the ranges conducting pistol training. 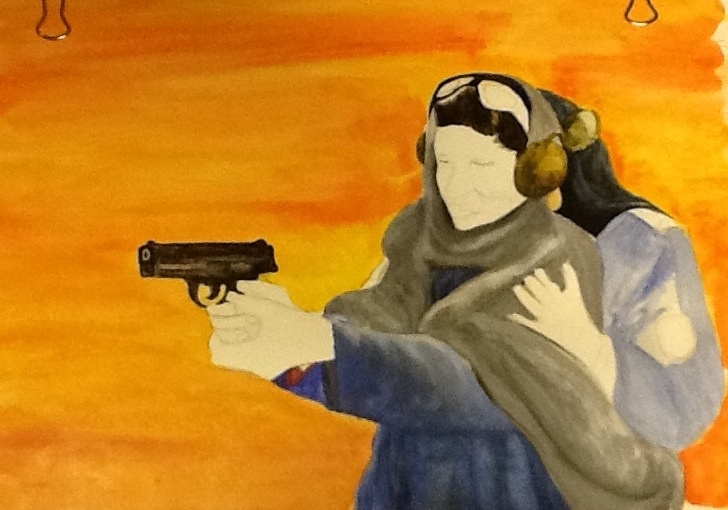 I wanted to create a bold and bright painting by laying a brilliant orange background in contrast with the blue of the AUP uniform and the dark blue/ coal shades of their head scarves. These women are in training at the Lashkar Gah Training Centre (LTC) which is the centre of excellence for police training in Helmand Province – where over 2,000 Afghan Nationals are trained each year to become policemen and women. 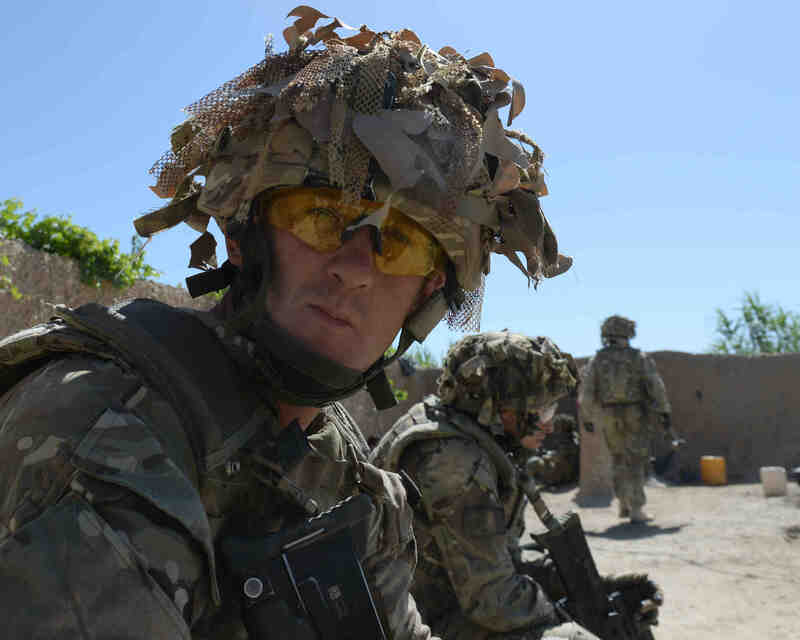 Their skill and courage is highly commendable, and their will is strong as they persist to be able to provide their own security – an Afghan solution to an Afghan problem, as is the running theme of OP HERRICK 18. 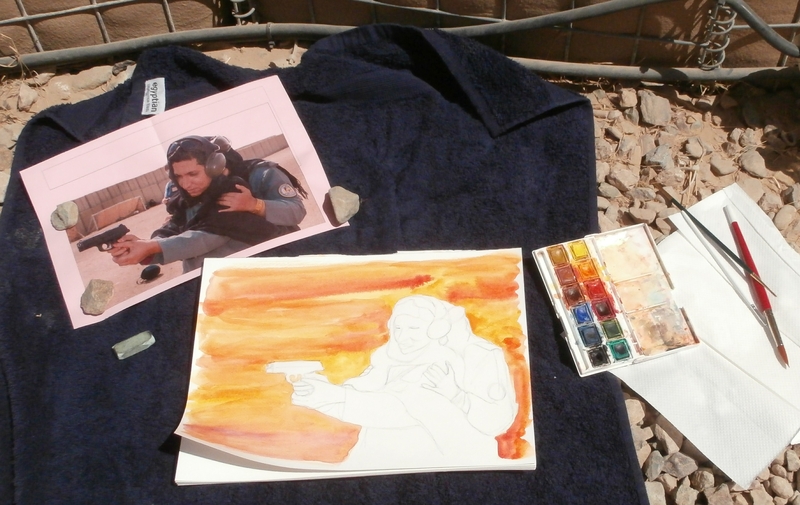 The painting starts life out the back of my tent but with temperatures still reaching 37 degrees Celsius during the day, I couldn’t spend much longer than 20 minutes outside – particularly as the paint was drying far too quickly! Here you can see I managed to get a quick wash of colour on the background before I turned into the shade. I am struggling to find the time to paint as my shift doesn’t allow time during the day, and at night; now sharing a tent often means the lights are out by the time I get back off shift. However, a fellow artist in the headquarters – the Brigade Movements Warrant Officer (BMWO) has regularly booked out one of the small conference rooms in the evening after 2100hrs, and so after hours we both sit down for an hour to paint. Although this does compete heavily with my gym time! Times of change are noticeably prevalent as I am one of two OP HERRICK 18 females remaining in our tent, whilst the others have all moved to the transit as they start their handovers with their replacements now occupying their former bed spaces. The ratio of red rats (7 Bde ) to green triangles (1 Mech Bde ) is rapidly increasing as they filter through their RSOI and start to find their way around the headquarters. I admire their enthusiasm, for some this is their first tour and for others they are seasoned veterans already. But I don’t envy them, nine months is a long time, and I’m glad my six are coming to an end now. 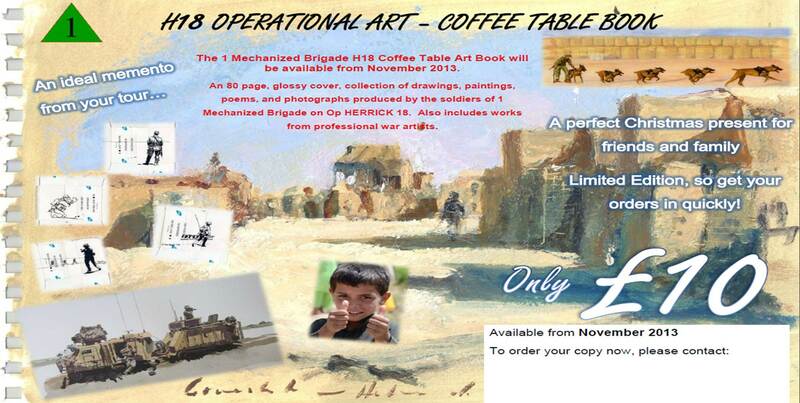 In addition to routine staff work I am in the process of selecting all the artworks from across Helmand; from paintings, pencil drawings, photographs and poems, for the production of the OP HERRICK 18 Operational Art coffee table book. A number of professional artists have deployed with various members of the Brigade during Op HERRICK 18 including; Graeme Lothian, Matt Cook, Hugh Beattie and Michael Alford to name a few. I have had a fantastic response from the soldiers of the Brigade and certainly have my work cut out with over 500 submissions to filter through. They will all be presented to the Brigade commander and his panel in the coming week. Throughout this sorting process, I have also managed to design a poster to be distributed amongst the Brigade and soldiers are already signing up for their memento. Copies of the book will also be available to the general public – so look out for information on the British Army social media pages if you want one! With only three weeks remaining I am incredibly excited already about the prospect of going home and enjoying my post operational tour leave! I also have a new job to look forward to on my return …more details on that in my next blog. 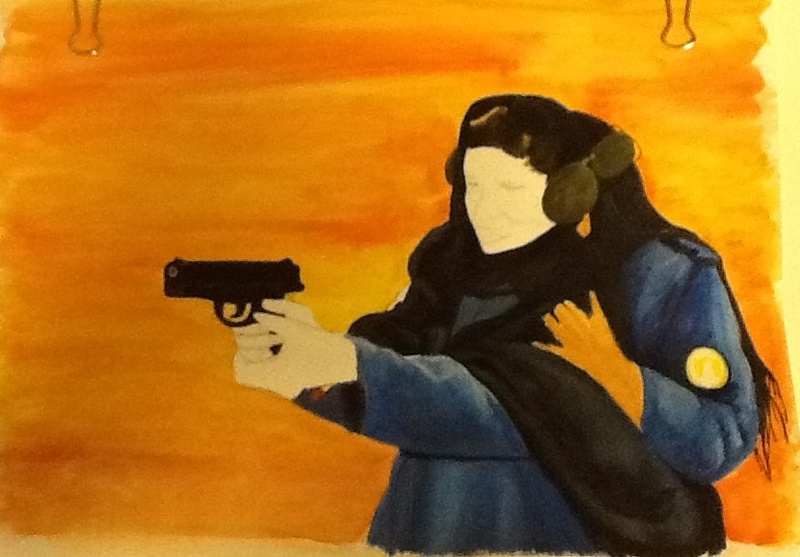 And to finish this blog, here is the finished painting of the AUP women. I am drafting this blog late at night sitting in a dark tent, with six other bodies sleeping, using the glare of the laptop to light up the keys as I type! 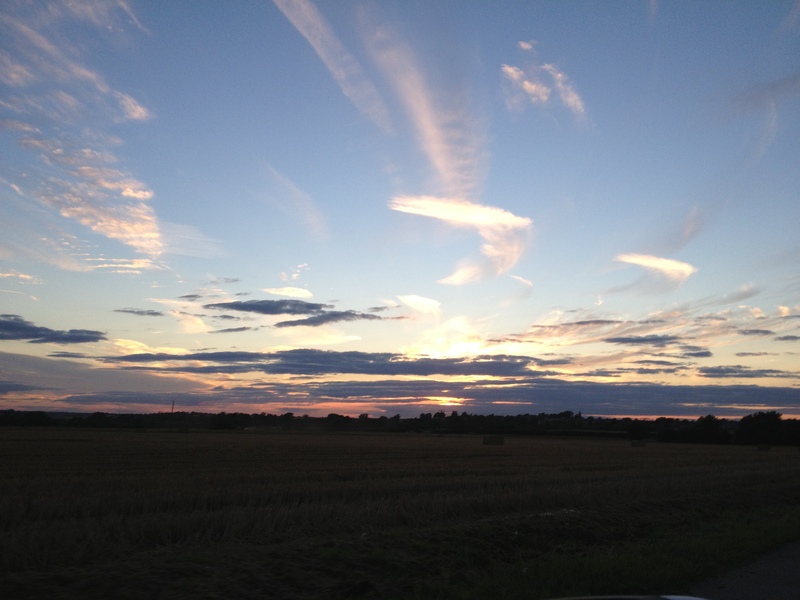 I have been quiet on the blogging front for a couple of weeks due to the move of the Headquarters and I have also been enjoying a break back at home on my R&R (rest and recuperation). However, now I am fully back in the swing of things it seems that was all a distant memory. In this blog I shall attempt to describe the past few weeks of events from the Headquarters move, to the journey home, and then a brief insight into what I got up to on R&R. 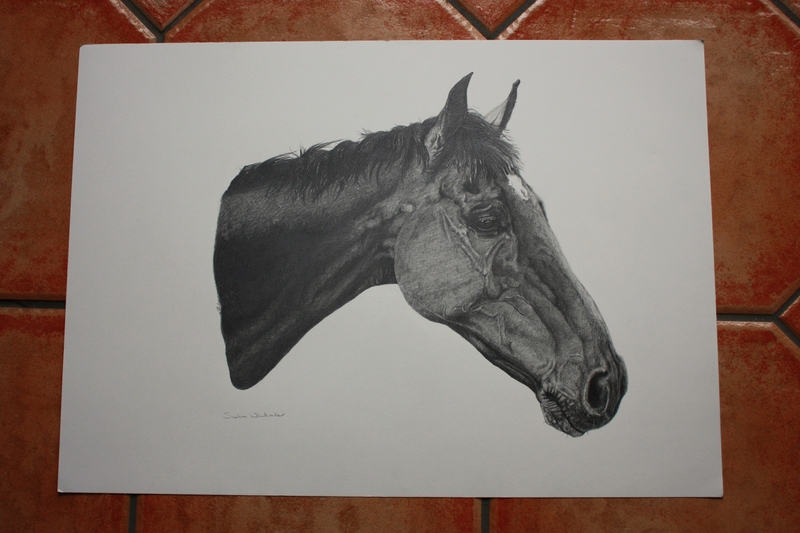 Running throughout the script I shall post pictures of the work in progress (WIP) of a pencil drawing that I completed whilst on R&R – the model is my future mother-in-law’s favourite horse, Harry. If none of this is of interest you then please don’t read on, for the rest there is a lot to report so do bear with me! 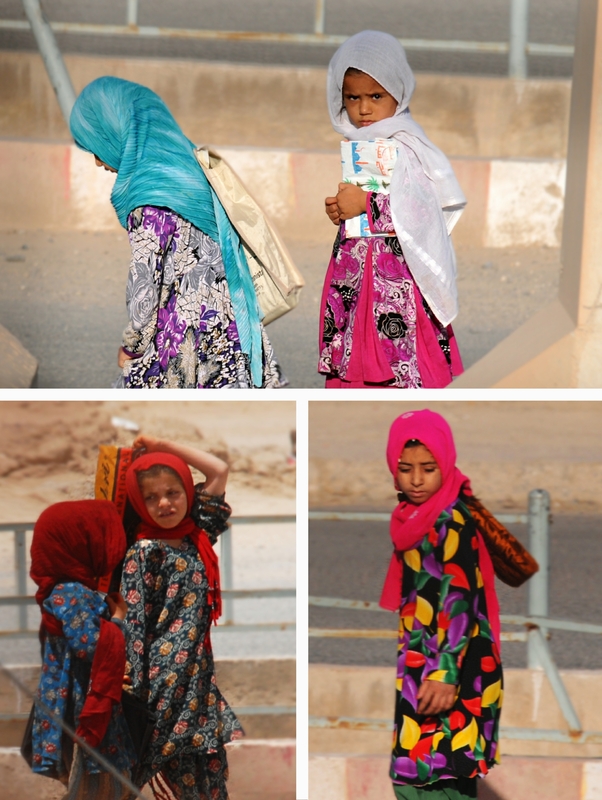 This blog starts in the hot and dusty climes of Lashkar Gah where I have spent the last four and a half months working in the Headquarters. The Headquarters has been based in Lashkar Gah since May 2006 and has co-ordinated UK operations across Helmand Province for over seven years. I was a part of what can possibly be described as the most complex headquarters move on operations ever undertaken by the British Army. 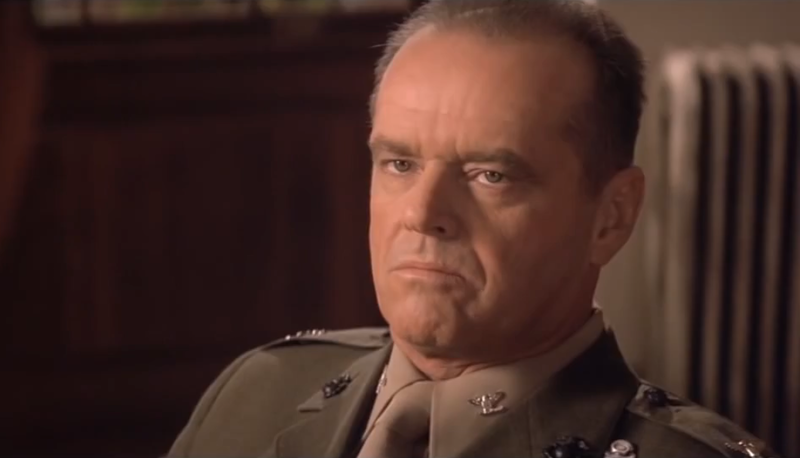 We were down to minimal manning, with the other half of the Fires cell having already established the Bastion set-up. I had come on shift at 0400hrs to enable to night shift to get away on their early morning flight, as I held the fort with one detachment commander (DC) for the Change of Command (CHOC) and the close down of the TFH headquarters in Lashkar Gah. It was a long morning and it seemed like an absolute age that we were waiting for the CHOC. With only a skeleton staffing, large screens on the walls showed locals going about their daily routine, as muted pictures of BFPS flickered in the background – time passed very slowly. My R&R wasn’t too far around the corner either, but we were all itching to get on and join the rest of the team in Bastion. When the time came for the CHOC, it was a very surreal and memorable moment. The DCOS (Deputy Chief of Staff) entered the JOC at around 1015hrs on 9th August 2013 to establish communications with the Bastion headquarters. Any current operational issues were swiftly dealt with and at precisely 1020hrs the DCOS spoke over the net (radio) to Bastion headquarters and clearly stated that the command of Taskforce Helmand had now been assumed by the Headquarters in Bastion. As those words fell from his mouth, it was quite an unbelievable experience as I witnessed history in the making. Although words can barely describe that feeling, it was as if I were watching an old war film where the news of war was being broken over the radio. This marked the end of an era, as we swiftly switched off laptops that had been diligently manned 24 hours every day for the last seven years. 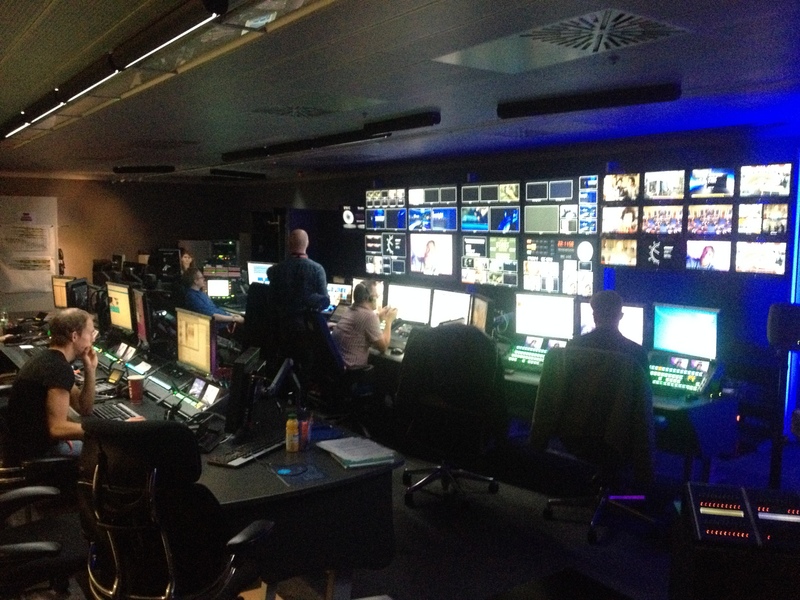 We switched them off, pulled out the cables and packed them in boxes. Cables were ripped off the walls where makeshift black nasty (tape) and cable ties had affixed them, and radios were disconnected to be placed away. Within minutes the Lashkar Gah headquarters ceased to exist and the remaining staff headed back to their rooms to finish packing for their onward journey to Bastion. As we waited at the helicopter landing site (HLS), we chatted about the prospects of what lay ahead, but most importantly – what our respective R&R plans were and for some even end of tour plans! It wasn’t long before we were given notice that the helicopters had left Bastion on their way to collect us, and we swiftly put on our PPE (personal protective equipment) before being led out to the HLS. I video recorded the two chalks (groups) of staff with my digital Olympus camera crouching alongside the compound walls as the two Chinooks flew in to transport us. It is said there are two types of people who look towards the Chinook as dust and stones are thrown towards us… one of them is a photographer! As we lifted up in a cloud of dust, I strained my neck peering through the scratched window, as I looked down at the wall of the HLS, symbolically painted with all the crests of other Brigade Headquarters that went before us, as I watched them fade in the distance. With so much nostalgia being left behind, there was nothing for it but to embrace the change and look forward to the new set-up in Bastion. 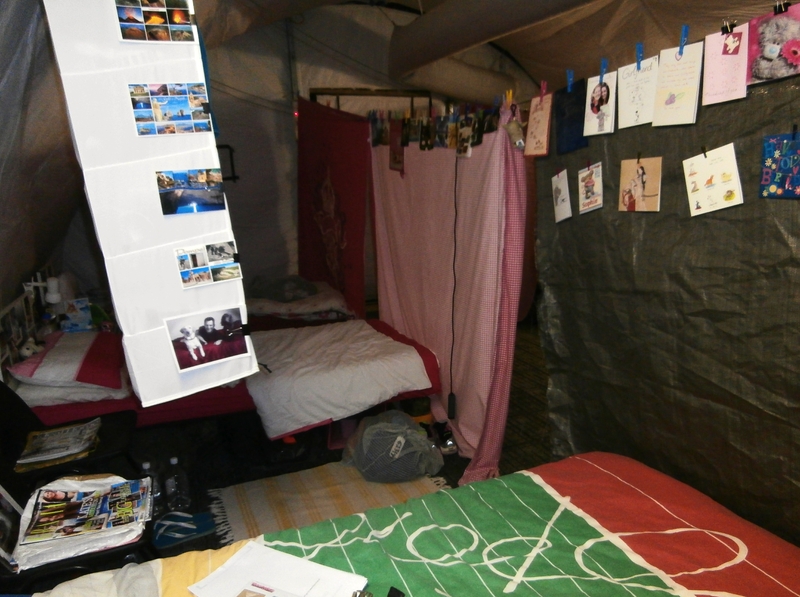 In no time at all, we found ourselves hot, tired and sweaty being orientated around our new accommodation and listening in to the security and welfare briefs. We were then walked immediately to our new offices where we took up our respective seats and started work, as if we had never been moved. The orientation and layout was different, and although we had access to all the same programmes, information and systems as before, we had more modern versions which took us all a while to navigate! The tempo of operations was still relatively quiet and after lunch I managed to shower and change and feel a little more human. Our new accommodation is a small camp within Bastion, protected by its own HESCO wall and rows of razor wire…’home sweet home’! I must admit, I have never been to prison but if this is anything to go by I’d rather not! 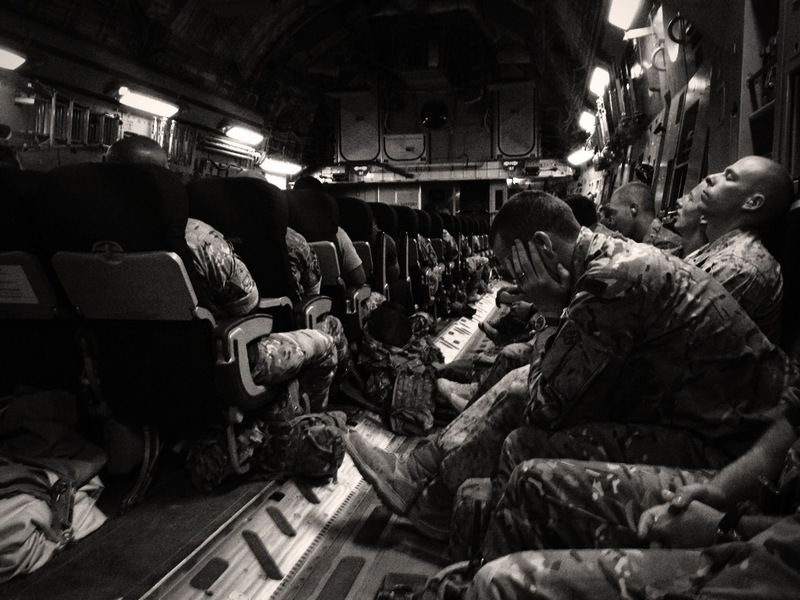 We are bound by various rules and regulations to ensure that whilst there are still troops ‘roughing it’ out in the FOBs, we do not succumb to ‘Bastionitus’ – a fond term used to describe the condition of complacency and comfort. Not that a 12-hour shift enables me much time for comfort; nor did I have time to fully settle in as I began to write my handover notes for my R&R cover. Within a couple of days of the move, I had to re-pack my bags to get ready to go home. The days, hours and minutes prior to R&R can be excruciatingly long at times, knowing I would be with my fiancé, family and friends in a matter of days and wishing away hours so that I would be closer to being home. Four and a half months is an incredibly long time to be away from home, and phone calls and internet can only maintain morale for so long. It was a great morale boost to find out that 24 hours ahead of my scheduled departure date, I had been ‘Space A’d’ that is, that our whole flight was fortunate enough to travel on spaces available on an earlier flight. I handed over my role and headed back to our Bastion echelon group to start the process in going home. 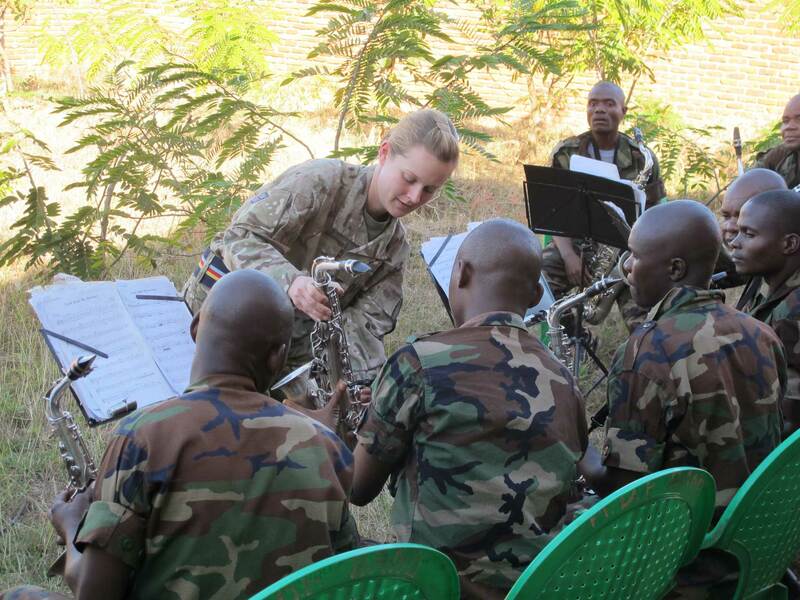 We handed in our operational equipment and stored our weapons in the armoury. I felt somewhat naked without my pistol attached firmly to my side and was constantly aware that I may have forgotten it somewhere! My OSPREY was also considerably lighter to travel back with. 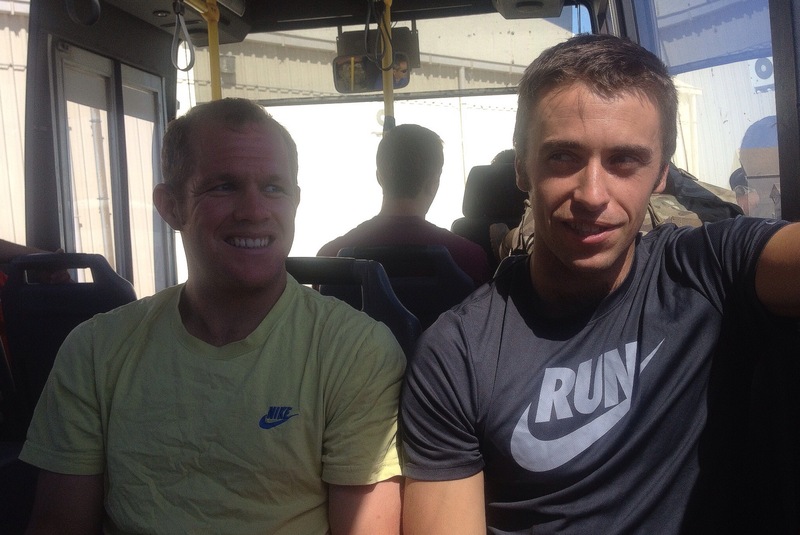 After our mandatory briefs, we collected our passports and mobile phones and headed on the bus for our first check-in. Here we labelled our baggage, checked in and loaded our hold baggage. 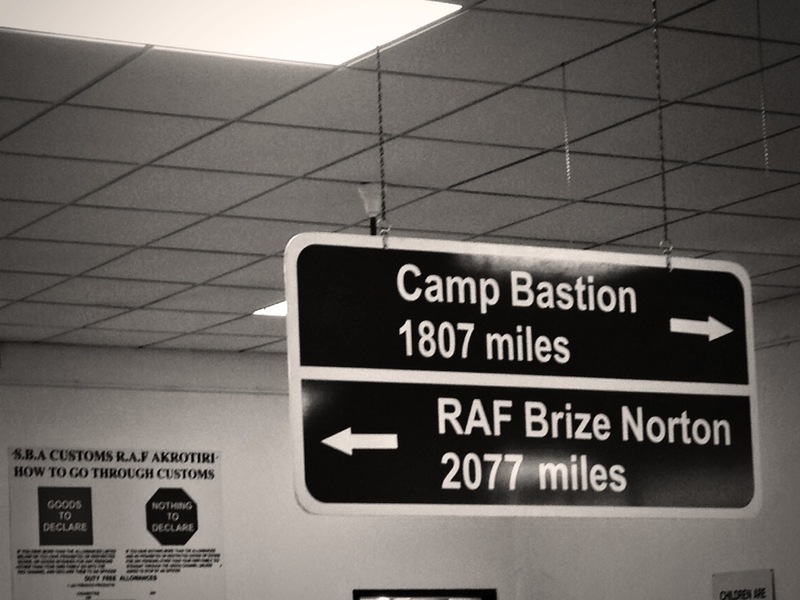 The remainder of that day I sat in the ops room and caught up with some Bastion friends. The second check-in wasn’t until the late afternoon, and having handed in our weapons we now had to be escorted everywhere. Thus it started – the long journey home, waiting for flights whilst fighting tiredness, impatience and excitement to see my fiancé, family and friends. We travelled out of Bastion to Cyprus on a Tristar, which isn’t too dissimilar in style internally to a budget airline. We were on our way home at last! I sat next to a female Lieutenant Colonel with whom I chatted to about her role in Afghanistan, and what we were both particularly looking forward to back at home; including lush green grass and rain. As we were busy chatting away about chickens, horses and ducks, the flight crew invited us to sit in the cockpit (perhaps because we were the only two to still be awake at that time of morning.) It was a brilliant experience as we were shown the controls, listened on the headsets and admired the views over Egypt (some fires could still be seen smouldering in the Capital). We admired the sun rise and it wasn’t long before we spotted the Cypriot shores among the haze of the sea mist. We belted up for landing and with our headsets on we experienced a very smooth landing in Cyprus. We disembarked for an hour to refuel and stayed in the very familiar departure lounge of RAF Akrotiri. I rang my fiancé (at about 0400hrs UK time, just 3 hours after he had eventually gone to bed after a long day harvesting…) to let him know that my flight was on time, only to ring him again ten minutes later to announce that I would be arriving an hour earlier than expected! Finally the green, yellow and brown patchwork of the fields of Britain came into view and shortly afterwards we were waiting for our baggage at the carousel. Black bags, gorilla boxes and camouflaged bags of all shapes and sizes were spat out and rapidly collected. When I walked through the doors of the arrivals lounge I joined the crowd of soldiers waiting to be collected. It was wonderful to be met at Brize by my fiancé as I walked over to the car park, placed down my baggage and hurried over to give him a huge hug! 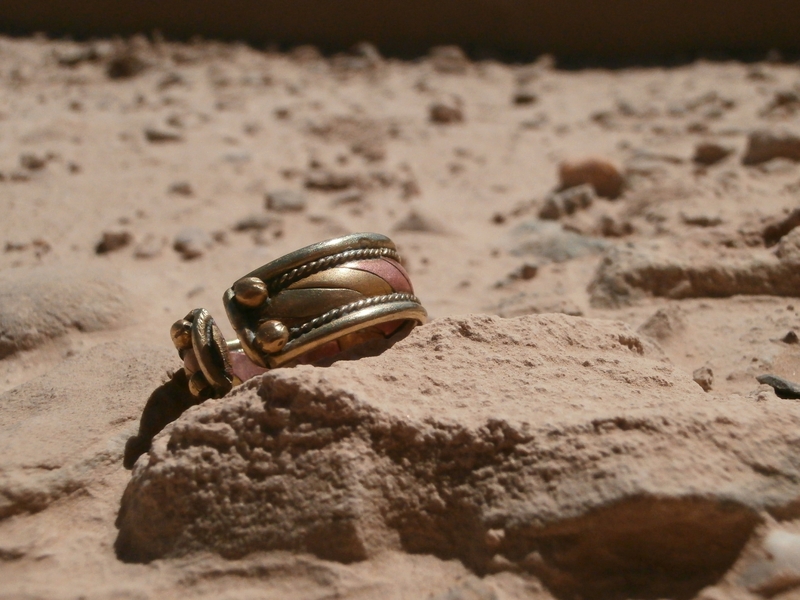 I was still wearing my cheap temporary brass/copper engagement ring that I had bought at the local shop, when he suggested I take it off as he revealed from his pocket my engagement ring in its box. 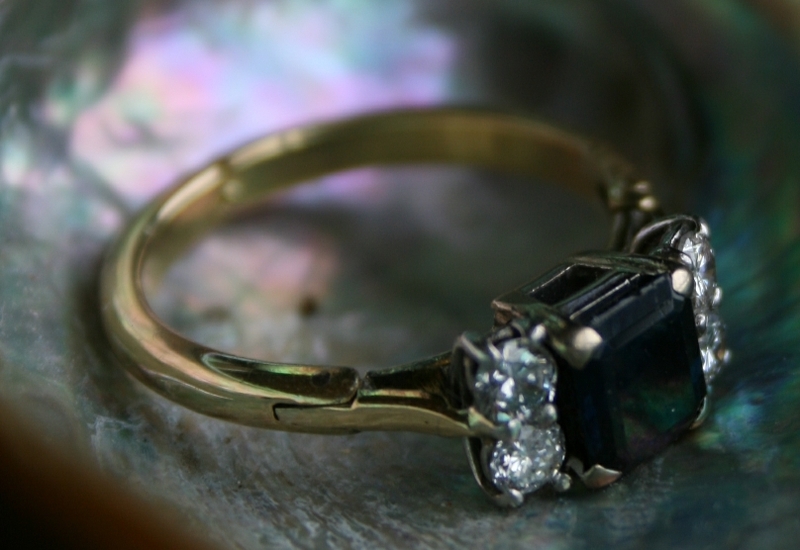 The ring is an heirloom, his late grandmother’s engagement ring, whom unfortunately I never had the opportunity nor pleasure to meet. I desperately tried not to fall asleep in the car on the way home but I didn’t survive contact. Having spent a few hours reacquainting myself with the M25 I was relieved to finally complete the journey and arrive home. Thankfully I didn’t make my usual faux pas of ‘talking’ to the dog first rather than my fiancé (principally because the dog did not accompany him to the airport!). Lola (the lab) and Boots (the cocker) were both excited to see me, and Lola couldn’t contain herself but kept bouncing and jumping up! She didn’t leave my side for the rest of that day, nor for a few after. 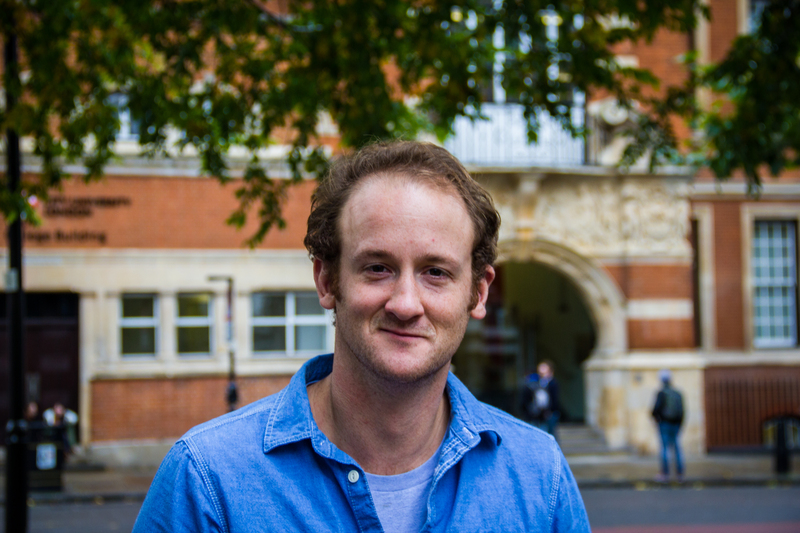 It was so good to be home, but I must admit I was exhausted, jet lagged and a little disorientated – all I wanted to do was crash out on my bed. It is a very surreal experience to find that within the space of 48 hrs you have been working at a high tempo, living by strict routine for four months and occupying your thoughts with little other than work matters; to waking up in your own bed and wondering what you have to do that day. It is almost as if I were living two different lives, and whilst the body adapts quickly, the mind takes a little longer. For the first few days I didn’t do an awful lot really, the dogs enjoyed some long walks and I didn’t even mind if it were raining! 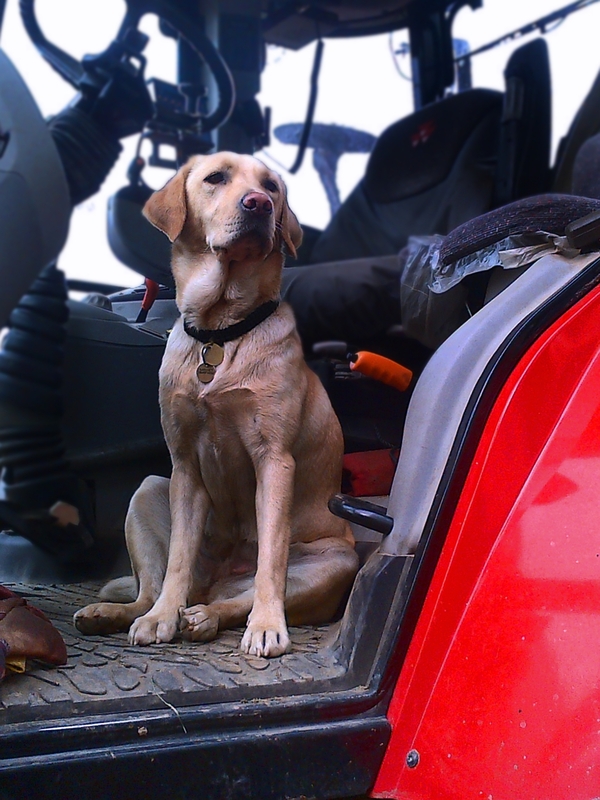 I enjoyed doing some training with them, as they are both working gun dogs (in progress), and it was a nice change for them after having spent many a day accompanying My fiancé in the tractor and listening to his rendition of the Kings of Leon! One night neither of us was sleeping particularly well, I was still jet lagged and My fiancé was worrying about the weather, so we ended up talking at 3am about wedding plans. It was so nice to be able to talk face to face and get inspired and excited about our wedding together. We were engaged a few days after Christmas, after which I had been thrust back in to pre-deployment training and then deployed. The first couple of days of my R&R were relatively quiet as I rang round friends to catch up, arranging to meet up with some and inviting others over. My fiancé was busy with the harvest during the sunny days and thankfully we had a couple of rainy days to spend time together. This was the perfect opportunity to crack the wedding guest list!! 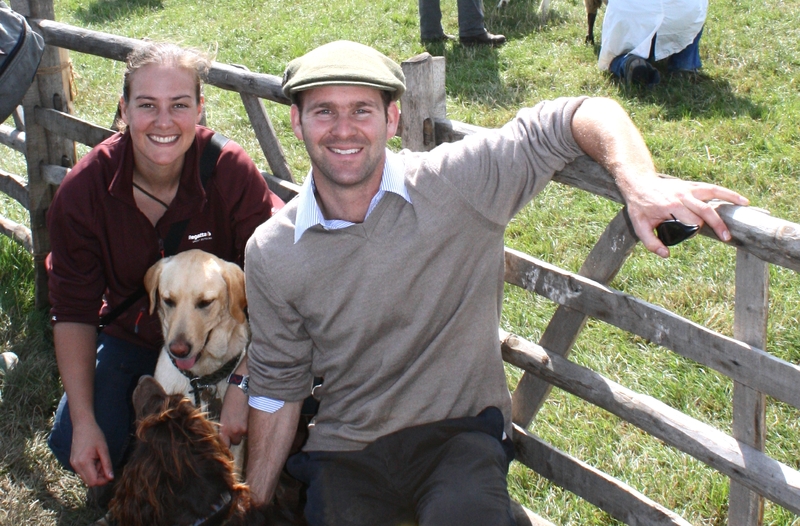 You wouldn’t have thought that either being in the military or part of the farming fraternity would incur so many friends and family – not that we could do an awful lot about the latter. After a rather hefty cull we fashioned a list of 150. My Mum came to stay the first weekend, and I managed to book an appointment to try on some wedding dresses, one of my sisters and future mother-in-law joined us. It was a very emotional experience for my poor Mum, who in less than a minute of me trying on my first dress was in tears! 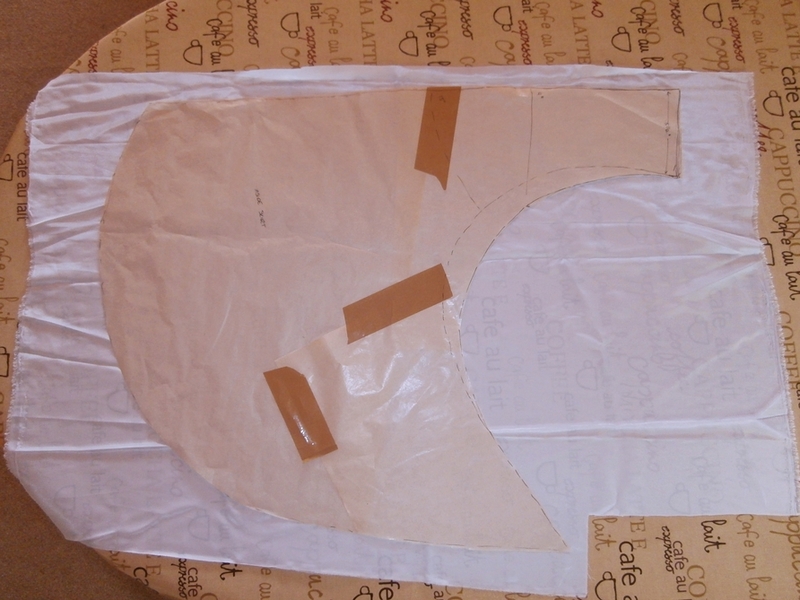 I tried on about six dresses which were all gorgeous and surprisingly even the ‘meringues’ were flattering, however, I am still intent in making it myself (with a little help and guidance). The following day, Mum and I had a look at some fabrics, and she helped me make a skirt from the silk I bought from Afghanistan. 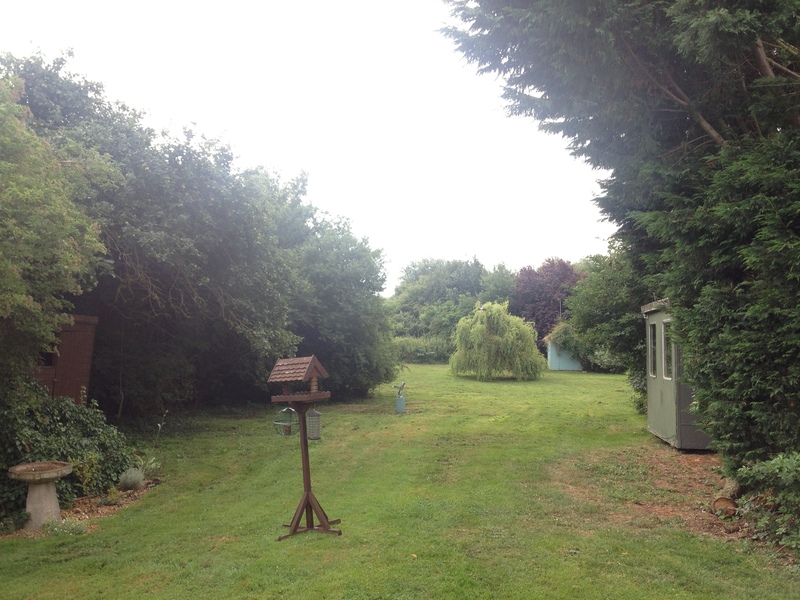 It didn’t take me long to get back into the routine at home; early rises, dogs, horses, chickens and lambs to be fed, along with runner beans, tomatoes and cucumbers to be picked. It wasn’t long before My fiancé roped me into helping shift a few bales and dropping off his various work colleagues back to their farm machinery! It wasn’t all work and no play, as my friends stopped by for tea, lunch and dinner and I frequented a few pubs too! However, my alcohol tolerance had significantly reduced from its level prior to deployment. Nevertheless a glass of chilled white wine at dinner was a welcome pleasure. Mid-week I had the pleasure of Hannah and Dan (from Ditto), and Graeme Lothian and his partner for company at dinner. I prepared home-made quiche, salad and new potatoes – something I had missed whilst out in Afghanistan. We had a pleasant evening and Graeme surprised me by giving me a copy of his book ‘ An Artist in London’ with a signed message to say ‘thank you’. The following evening My fiancé and I attended a dinner dance where I managed to catch up with a few more friends. That bank holiday weekend was a local agricultural show. My Dad came to visit and joined My fiancé , the dogs and I for the day. 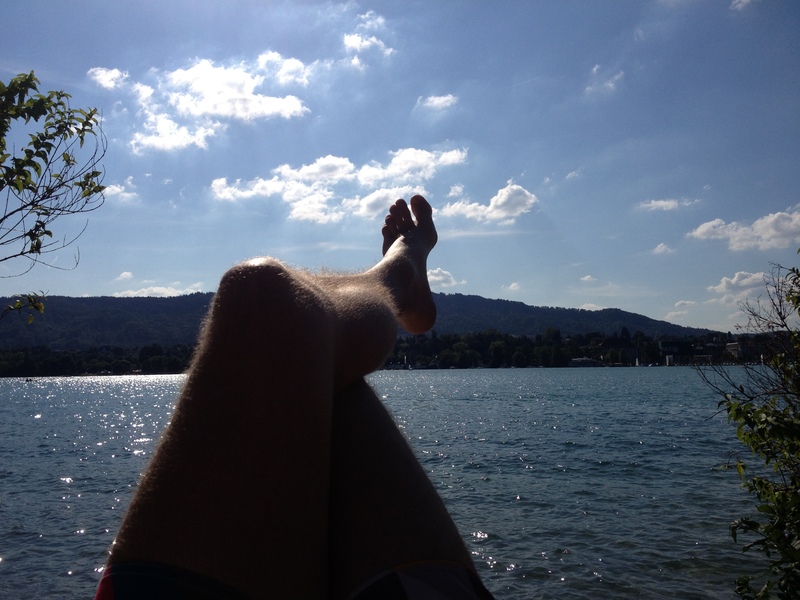 Unfortunately this indicated that only too quickly was my R&R coming to an end. 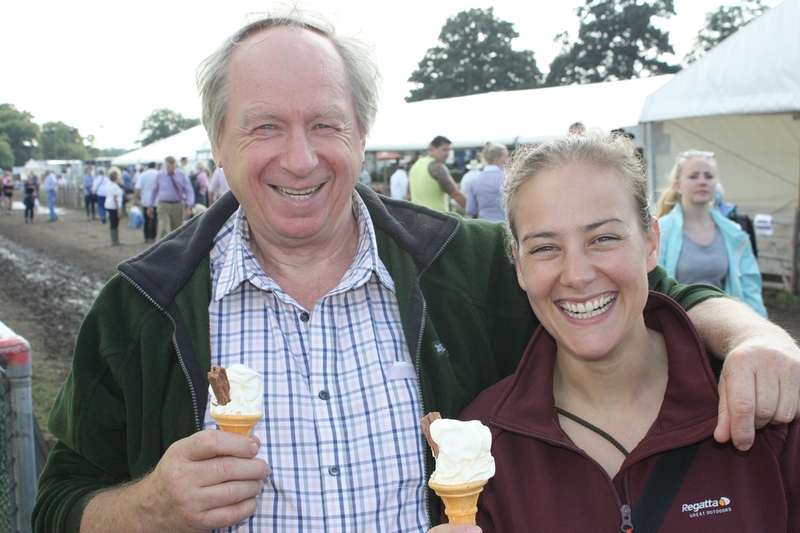 That afternoon we left the showground and I said goodbye to Dad. I packed the remnants of my kit, grabbed a quick dinner, changed into my uniform and jumped in the car ready to go back to Brize Norton. Even the dogs knew I was off as they recognised me wearing the uniform and saw the bags being moved to the car, wearing that worried and forlorn expression that only dogs can. I said goodbye to my fiancé at the airport car park, knowing that I would be home again in just a matter of weeks. In some ways you strangely look forward to getting back to Afghanistan, if only to see everyone again. Once resigned to the fact that I was going back, there is nothing to do but look forward to it and enjoy it, for that way time goes faster at least. With less than six weeks to go on my return, the worst was over and there will be plenty to keep me busy! I shall save my first week back at work for my next blog, by now I am sure you are as exhausted of reading this as I was when I got home! Whilst travelling back to Lashkar Gah from Price, I transited through Bastion for a day and spent some time with the ‘Bastion Ops’ team, whom I talk to daily over the Polycom in my daily update brief. I had my camera out when the MTWO (Motor Transport Warrant Officer) grabbed me and suggested that I take a photograph of her team there and then, sitting on the bench in the ops room. In fact, she demanded that I produce something memorable for them! Now the MTWO isn’t the kind of person you say no to, and so I hurriedly snapped away at the somewhat reluctant faces either side of her. She suggested that it didn’t matter what style I managed to produce, so long as it was fun … and that she wouldn’t mind a caricature…so that set my thoughts going! I have never drawn caricatures, and on reflection of this project, I probably ought not to attempt them again! I googled a few ‘how to draw caricatures’ guides on the internet and printed off some examples to have a practice and see how I got on. This was certainly easier said than done! I managed to copy the examples with no problems, but I found it hard to steer away from drawing what I saw realistically, instead ‘seeing’ a caricature and highlighting obvious features of recognition. 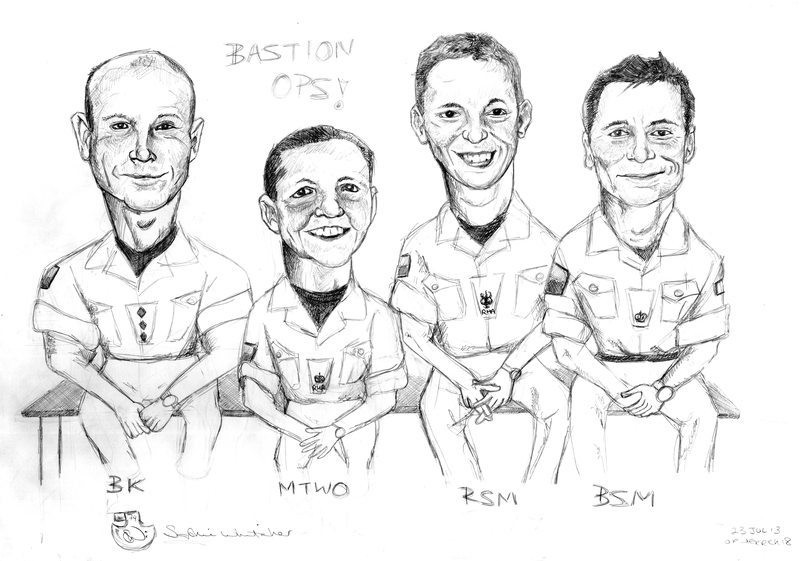 Nevertheless I had set myself this aim of creating a caricature of the Bastion Ops team, and would persist to see what I could come up with. Here is the final drawing – I purposely tried to keep the faces as the main focus with only rough, sketchy lines to indicate their bodies in order not to detract away from their faces. 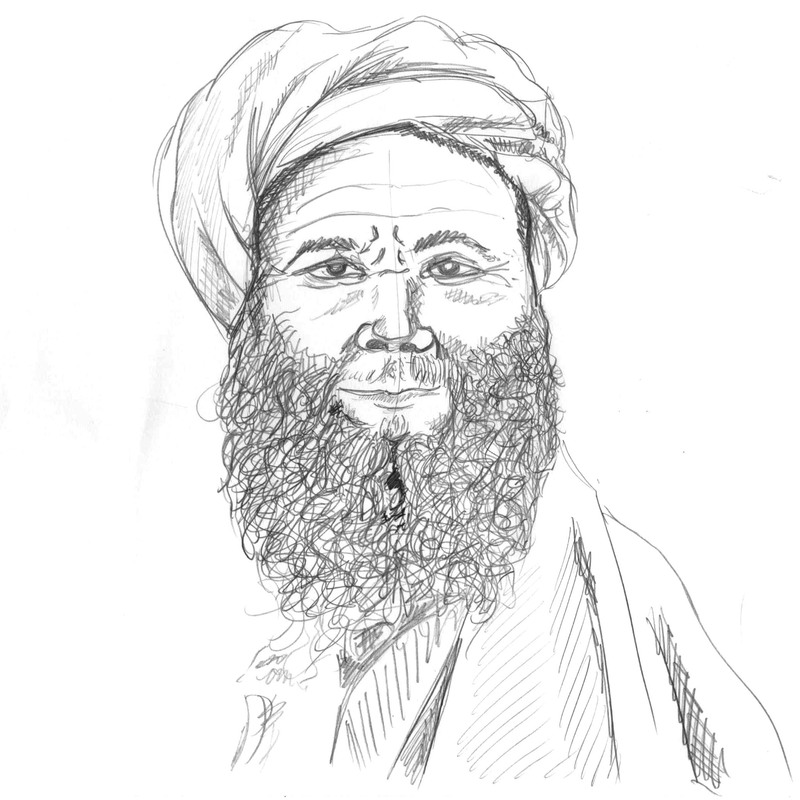 As a first attempt at a recognisable individual, it wasn’t too bad – the team certainly recognised themselves, but a little more work is needed on this style of drawing! I ‘revealed’ the finished drawing to them during one of our daily conferences, as it appeared as the final slide to the powerpoint presentation entitled ‘Any Other Business’. It was a little light humour over a weekend, as the weeks so often merge into one. Thankfully, it was very well received and the individuals in question shared the humour. 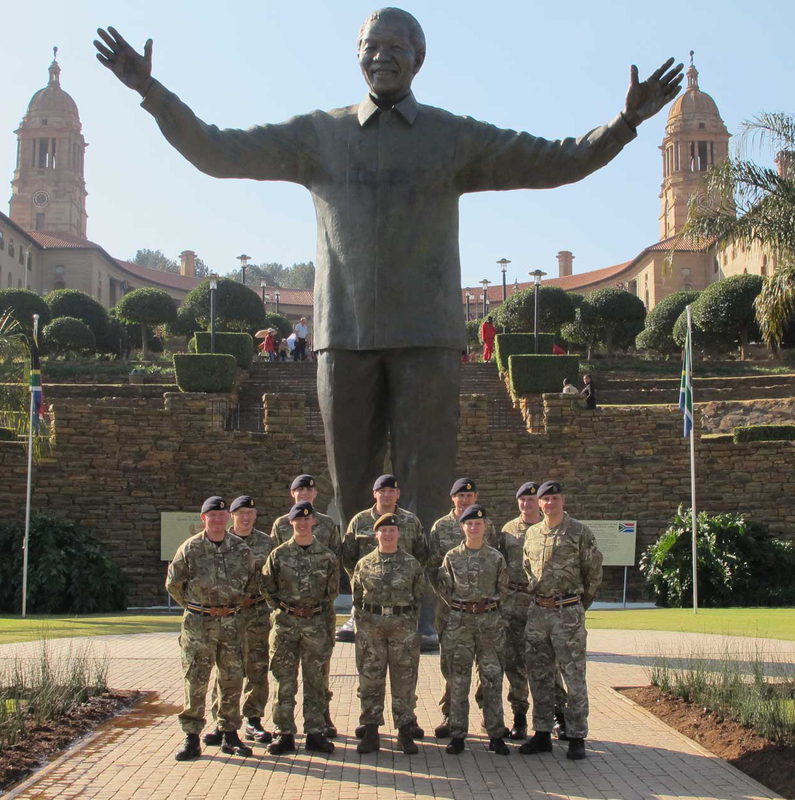 The RSM was particularly happy as he appeared around ten years younger, whilst the BSM now has an idea of what he will look like in ten years time! The BK also noted the size of his biceps whilst the MTWO appeared younger! 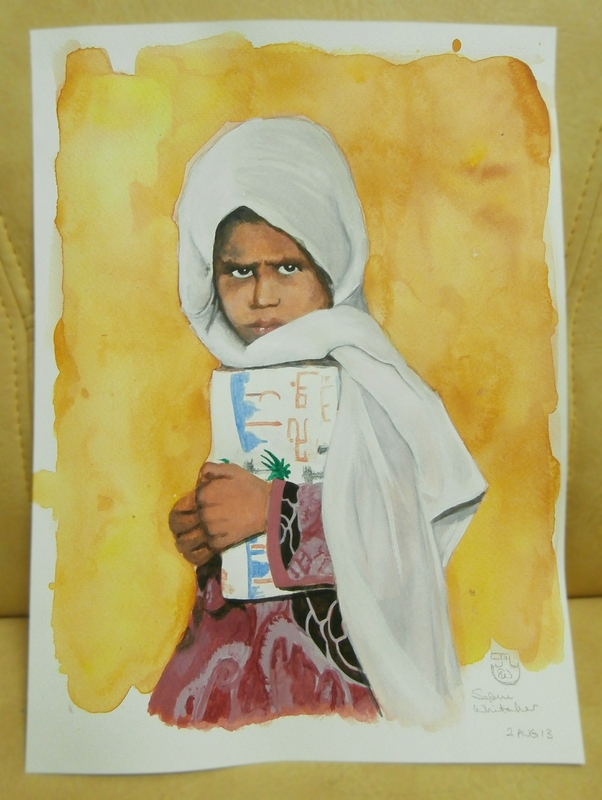 However, in the aftermath I thought I would stick to what I knew and decided to produce a watercolour painting of a little girl who caught my eye as she fleetingly stared up at the sangar as she walked past with her classmate. I wondered what she could possibly have been thinking as she wore such a suspicious and perturbed expression whilst clutching her book. 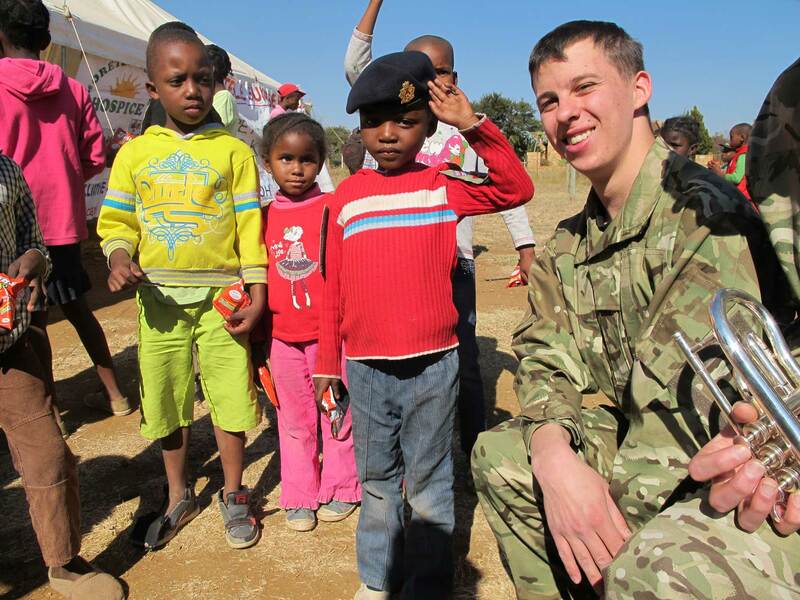 The perceptions of ISAF troops vary considerably from children who rush from their houses to wave the troops past, to those that are only too happy to pick up the biggest stone and take their best shot. I thoroughly enjoyed working on this piece as it was painted on nice grainy watercolour paper, and I had forgotten what a difference good quality paper makes! The Movements Warrant Officer in the headquarters (another keen artist) had returned from a visit to the UK bringing with her a large pad of the paper, and very kindly gave me a few sheets. 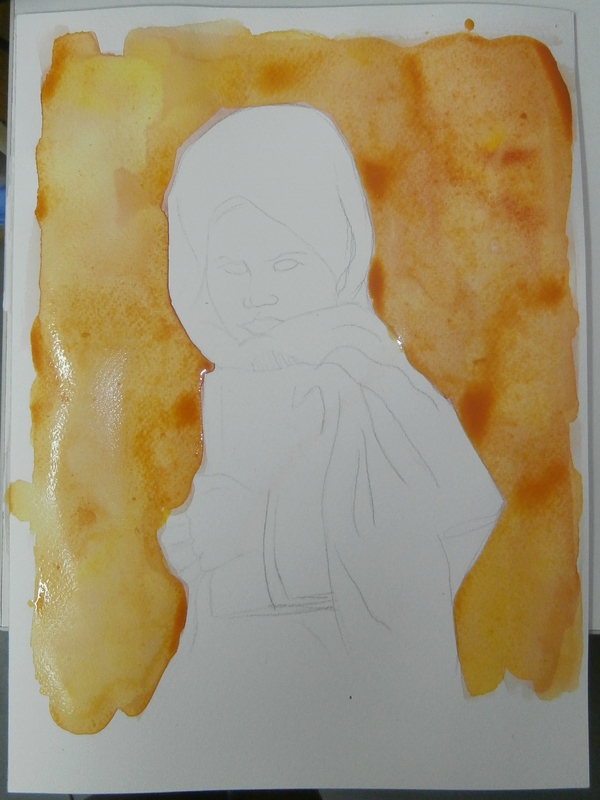 I love the way the paint is absorbed into the paper, and the subtle shades but deep colour it enables. Well I must admit that I find acrylic encourages me to paint in layers and blocks of colour whereas watercolour is a lot more fluid. I particularly enjoy the free flowing nature of watercolour paints as I use flow of water to place the paint on the paper in a loose and carefree manner. 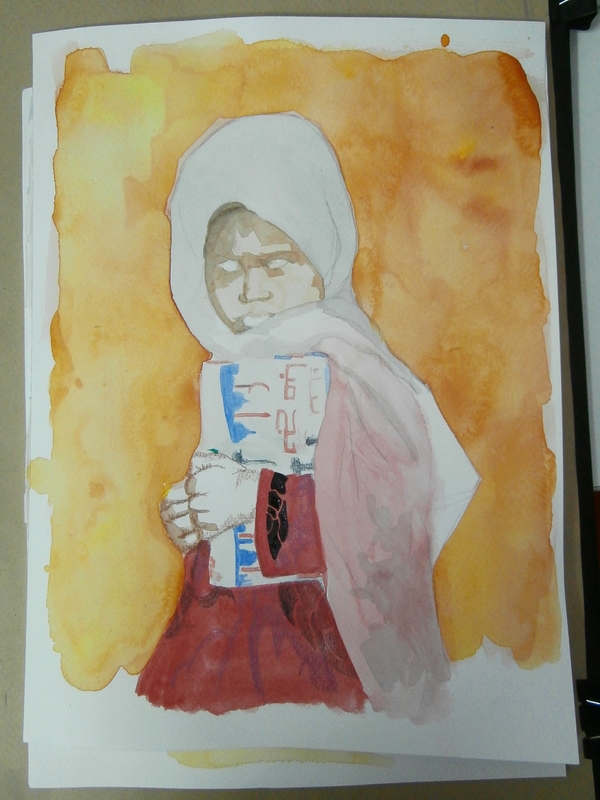 I started this week’s painting with a background wash of yellows and brown infused to create a mottled and patchy backdrop.Once this had dried, I started to work on building up the cloth and texture of the girl’s dress and headscarf. A suggestion of the pattern on the dress, and the shadows of her headscarf start to take shape before I hint at shading her face. You may notice in this picture that I have also used some watercolour pencils to mark out the dress pattern and the detail in her hands prior to painting them. It wasn’t long until I had completed a very simplified suggestion of a pattern on her dress, and had built up the layers and shading of her headscarf. 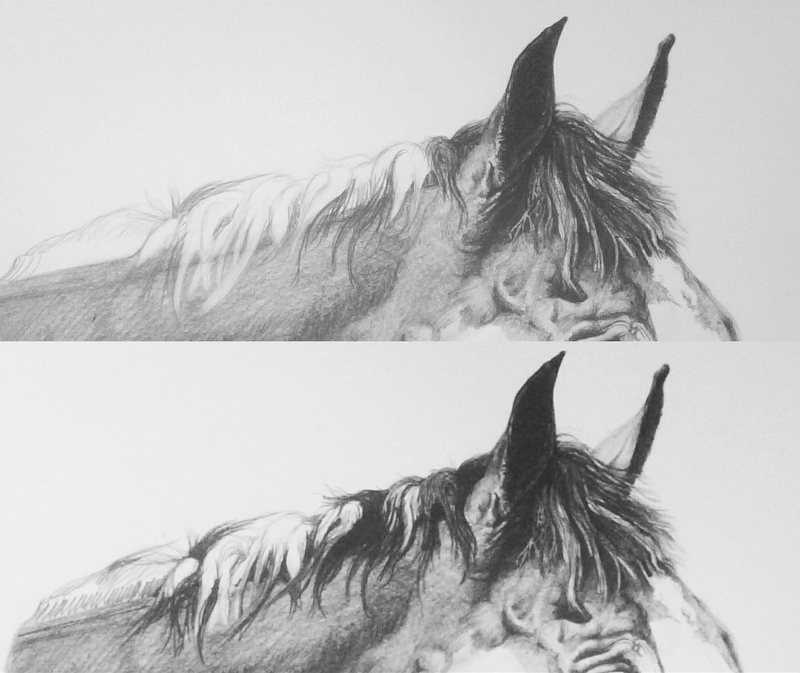 Unfortunately I didn’t manage to take any pictures in between these stages as I was too busy concentrating on working up the shades and texture. Once I had completed her clothing, I focused on her hands and troubled expression. 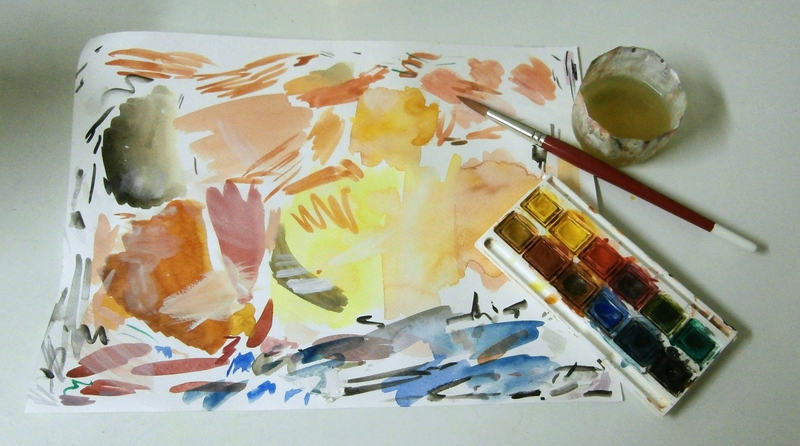 Skin colour is often hard to gauge but I always start with a rough mix of yellow, brown and red, using white and blue to vary the lightness and darkness. The more red and white I add, the more pink the tone, whereas adding brown and a smidgen of blue will darken the tone considerably. In extremis, I also use a black, but tend not to make a habit of it. 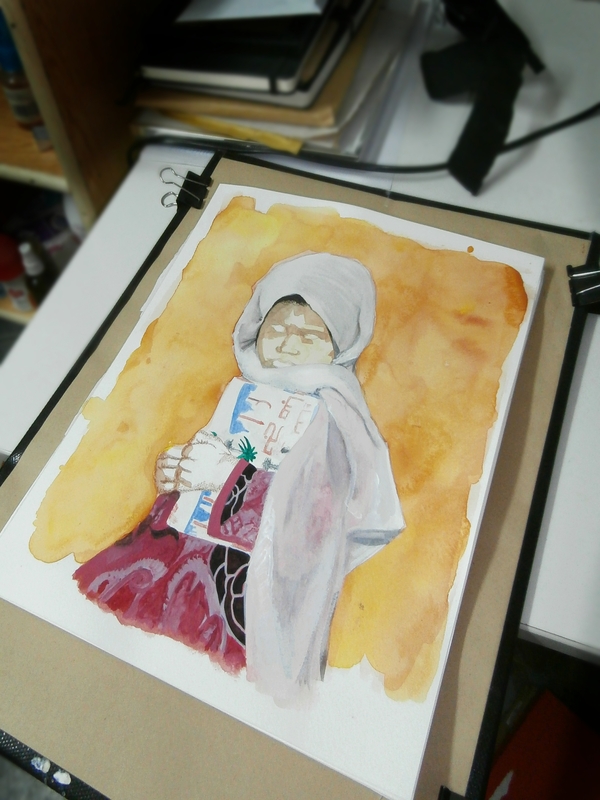 I prefer to paint the face light to dark, starting with a light base layer and building up darker layers working from the edges of her headscarf and fading towards the centre of her face. I particularly wanted to make her frown stand out, and focus on her eyes. So here is the finished piece for this week! This next week will be very busy as my room is packed up and my work space limited to a ruggedized laptop and monitor, two phones and a handful of stationary. The rest of the office should be making its way to Bastion where, at the end of this week, I too shall soon find myself! 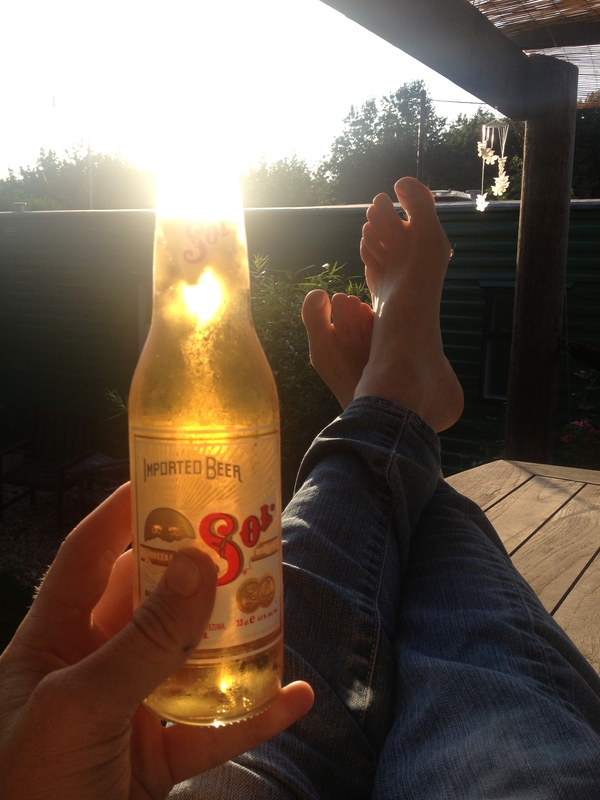 I am incredibly excited at the prospect of my R&R which is now only a week away! I can’t wait to see my fiancé, the dogs, the rest of my family and friends! Not long now.